A Chest Holster is the ultimate way to carry a firearm when outdoor activities make it inconvenient (or impossible) to hip carry. 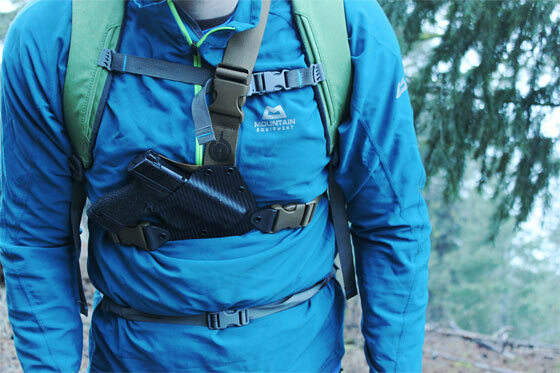 Activities including hiking, back country travel, hunting, fishing, riding an ATV, backpacking, etc.. may be more comfortable while wearing a chest holster if you choose to carry a firearm. Depending on where you live, venturing out to hike, fish, camp, scout game trails, etc.. can put you at risk. Whether it’s protection from teeth and claws of 4-legged predators or life-threatening encounters with 2-legged predators, it may be smart to include a sidearm as an important part of your gear. For those of us who get out into the woods, back-country recreational areas, along hiking trails, in fishing streams or at campsites, everything we have is attached to various parts of our anatomy and must work together with all other gear strapped to our bodies. Adding the mass of a sidearm makes it more inconvenient if not impossible to deal with. While a hip holster (IWB or OWB) might work okay for a casual and relatively short walk in the woods or trail with a light-small backpack, this will not be the case for a longer or more strenuous hike especially with a larger backpack and other gear that you may be wearing. A chest holster will be more comfortable. Shoulder and sternum straps across your torso distributes the weight of the firearm to your body core rather than hanging on your hip. A chest holster allows you to carry a larger backpack. 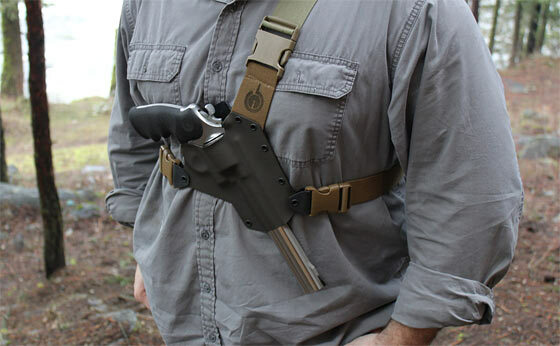 Carrying a sidearm on your hip will likely interfere with the carry of a larger backpack. A chest holster provides quick access to your firearm. Seconds count. A chest holster will carry your firearm up higher on your chest (hence the name!) which makes it uniquely ready and quickly accessible for draw, even when shouldering a backpack, fishing with waders, etc..
A chest holster that fits snug eliminates snags and a floppy gun. Hip carry will more likely snag on things while traversing the woods. A chest holster enables a snug carry right in front of you and the firearm will not slap around as you move about. A chest holster could be critical during a bear attack. Front access to your firearm, even during a fetal position could save your life. There certainly are a variety of manufacturers of chest holsters. One company that I highly recommend (they are not an advertiser) is GunfightersINC. I say this because I have a number of their holsters and have been 100% satisfied. What has been your own preference for carrying a firearm while out in the woods, on the trail, or places such as this? The biggest Dis-advantage I found with a Chest Holster (I actually tried one) was the draw length. Meaning the distance from gripping the firearm to the point the barrel clears the holster. This action brings the ‘draw’ quite high to the shoulder, especially for a revolver such in your photo at top. Personally I prefer the ‘Under Arm’ holster with a vertical hold and a front ‘break-away’. It still allows for quick access, a larger back-pack, and most have an opposite pouch for Mags (I carry two) which also counter the weight of the firearm. The Dis-advantage of an underarm holster is you will ‘sweep’ your arm when you need to pull your firearm, keep your finger OFF THE TRIGGER !!!! Additionally, a shoulder holster restricts the ability to carry a backpack whereas a chest holster does not. BUT, we all experiment with what works for each of us. Good food for thought, ya need to figure this stuff out now before TSHTF. I’ve never had a problem with a shoulder holster while carrying a backpack. It does require a cross draw, but that isn’t an issue. Personally, I usually wear a tactical vest that accommodates a front mounted holster. That places your draw hand closer to the sidearm than a chest rig. Since almost eight months of the year dictate the need for layers of clothing, access to the weapon can be difficult. Years of wearing a variety of tools in construction have given me practice in below the waist carries without obstruction of my movement. If I could not carry a chest rig outside my parka due to a pack, ventilation, de-layering convenience, … I would prefer a high and secure thigh rig. Any comments? I have used chest carry for years, but had to fashion my own rigs. Other than the concealment factor, chest carry is far superior to all others in accessibility, comfort, and being able to maintain control of the weapon being snatched from your person by an attacker. After years of carrying a handgun, handcuffs, handi-talkee, extra ammo, taser and baton hanging around my waist and dealing with the nerve damage that resulted, I have no desire to continue the practice in retirement. Hence I pocket carry to town, chest carry on the farm. As an aside, the chest pockets on bib overalls (my normal everyday apparel) make dandy holsters for compact and subcompact handguns. Since I spend the majority of my day on a tractor, UTV, or other equipment sitting down, access to my weapon is much easier. I used to carry horizontal underarm carry for some years, but the velcro (Uncle Mikes) would abrade my arms if I wore short sleeves. But it was handy to access and a ‘Tankers Holster’ I think would work great. I’ve got the Gunfighter’s Kenai chest rig with holsters for several of my handguns. Very comfortable, very accessible when wearing a pack. A little on the pricey side, but worth it. ‘Tanker’s Rig’ worn concealed for 1911, two mag pouch to help balance. Crossdraw belt rig for .357 Ruger or .22 H&R 929 revolver (doesn’t catch on rifle sling like Tanker’s Rig or shoulder holster does). 2 speedloaders for .357 on belt. Repurposed CCI shotshell box for .22 in left breast pocket (Wish I could find .22 MTM ammo wallet like one I have for .357). May have to try chest carry for Crosman 1377, though. Have holster which will work for it. I’ve got a box full of shoulder rigs that have been given to me by folks who bought them only to find them too uncomfortable to wear. I dutifully tried them myself before retiring them to that graveyard of “sounds good but don’t work for me” accessories. I had one that worked for me. Bianchi, if I recall correctly. It was a vertical, reverse clam-shell design that secured the weapon, a SW mod 19 revolver, by spring pressure, enabling pulling straight out without having to lift up or work a thumb break or strap. Loaned it out, never got it back. More power to those who like shoulder rigs. Not for me (except that lone exception. The only thing I can think of that has more drawbacks are ankle holsters. Not so sure about a chest holder. Any other women wondering about this? I often wear a tanker rig when roaming my hunting property. Mostly because it allows arm movement and easy access to pistol. Does not interfere with a backpack. I usually wear a shoulder holster in the woods. It rides in front of my left arm, and lower towards my waist line. Very comfortable. Also, when I draw, it doesn’t come up to high, and clears nicely. That’s my big gun. Usually, I have a smaller gun somewhere else on my body that can’t be seen. Can’t be too well armed, you know. Crossdraw belt belt rig for me. My preference for carry in the wilderness is a dependable, focused gun bearer never more than three paces behind me and intensely focused on assuring that I have a properly maintained, loaded firearm of adequate caliber for dealing with the threat placed in my hands at the precise moment of need. He should also be discrete when in the presence of strangers and very reluctant to recount “Let me tell you what the boss did when…” stories even if he should be plied with strong drink. Such a man, such a boon companion is a treasure beyond price especially if he’ll work for a mere pittance and an occasional kind word. I wore the “Bra of Death” (shoulder holster) while recovering bodies in streams or bodies of water where the rookie has to stuff the body into the vinyl bag. Body was placed in the bag before removing from the water. The water was up to my waist with occasional falls submerging me and my gun. Freshwater usually had me cleaning and re-oiling my revolver at the end of the day. I had a Bianchi shoulder rig. The best way to fit a shoulder holster is to go into a tailor’s shop with an experienced undercover cop. Adjusting of the holster is best done by the tailor and the cop while the person wearing it should stand straight up and flex when told to flex. Trying to do this at home alone in front of a mirror never seems to work. The Alaskan style holsters pictured here are for special purpose to be worn with backpack in bear country. I do not have one at present time. Chest rig worked great for me in Alaska as carrying a .454 Ruger Red Hawk any other way did not work. Sold weapon and rig to a neighbor when I sold out of Alaska and moved to Georgia. Found out later he had a run in with a brownie just a mile from my old house. He took his dog for a walk and at the last minute put the Ruger in the small of his back. He told the newspaper the bear was on him so fast he didn’t remember pulling or emptying the weapon. He said he wished he had on the chest rig as a slower pull was why the dead bear still ran him over. I think I would have needed a underwear change. I agree. Access for both hands.Been using a Pacific Canvas & Leather, victory flyers holster, for years now to carry my 4″ GP-100 when hunting ,hiking, mushrooming. Keep it oiled (neat’s foot) I’ll check into GF inc holsters. I use a leather chest rig for my 1911 while riding both on and off-road motorcycles. For the back-country trail rider, this is a great way to have quick, secure, yet concealed access to your weapon. Check out the kit bags from Hill People Gear. Solid construction and does double duty for carrying various other items as well as concealing a full sized firearm. I recently did a 20+ mile hike through WV will full pack and my original kit bag holding a 9mm Shield with a spare mag, plus wallet, cell phone, keys, etc…etc. Great piece of equipment. The Kit Bags by Hill People Gear are the most comfortable way I’ve found to carry a firearm discreetly on your chest while also being able to carry other essential items as well. They have a variety of sizes and colors ranging from $85-$125 and all are made in the USA. Can’t go wrong. I like the Diamond D variant in bear country. It holds to your chest as tight as you want, leaving two hands free, such as for fishing. A potential draw situation occurred a couple weeks ago when a bear came out of the woods about 30 yards away as my kids and I were fishing in SE Alaska, but as I backed up the thing sat on its haunches as if to sit back to enjoy the show. I turned away momentarily (I know, a mistake) to make sure the kids were also exiting the drainage, and when I looked back the bear had disappeared. Oh well, not really a close one, but sure involved a pucker factor . Wow – great example for this type of holster. And I’ll bet that bear was a grizzly, given your location at the time! Bears are amazingly quiet and stealthy. And, they can be very fast – quick acceleration as they leap into a run. I love the idea of a thigh rig. Its by your hand, out of the way and ready to go. The issue I have with both thigh and chest is that I am a conceal carry guy. I dont want the nongunners to whine about the Glock 26 and I dont want the bad guy to know how I will take him down. Any way to conceal either of these systems? My favorite carry method is apendex with a sticky holster.